Did you catch my “controversial” post on how you can build and grow your email list without a website? Yeah, you read that right. Contrary to popular belief, when you’re in the product or service creation phase, you don’t need to wait until you have a full-blown website to get started on list building. I couldn’t have said it better myself. So, you may be familiar with the ways you can grow and build your list. But, what about when it comes to actually writing the copy for your email marketing efforts? Yes, according to a MarketingSherpa study, 72% of U.S. adults prefer to communicate with companies through email. That doesn’t mean, however, they’ll actually read and hang onto every single word you write. Especially if you’re not doing it the right way. After all, we’re talking about the inbox of your ideal customer here. And, that’s a seriously crowded place not only to try to squeeze into, but to also make a great impression based on one thing and one thing only—your subject line. 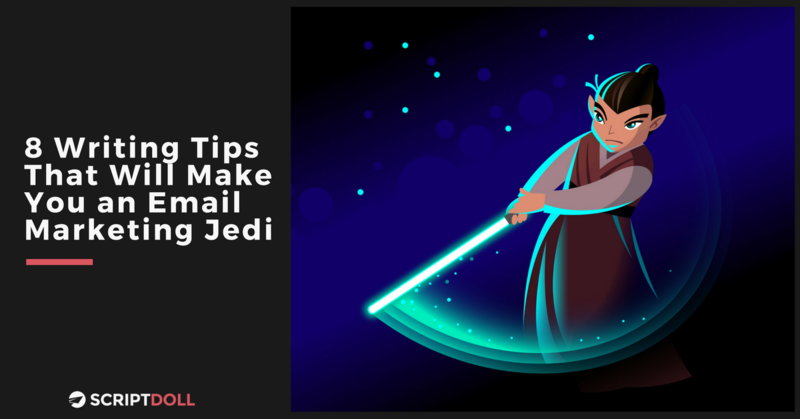 All that said, I’m here today to share the eight tips you need to become an email marketing Jedi in no time. Get ready to drop copy that gets noticed, and better yet, read and acted on! If you’re a regular reader of the ScriptDoll blog, you might get tired of me repeating this over and over and over again. But, knowing your target audience is absolutely critical to the success of not only your product or service, but also your sales copywriting efforts. So, don’t skimp on it. Easier said than done, am I right? I’m not going to sugarcoat it—actually honing in on who your audience is, what motivates them, how you can reach them, what they’re looking for from you, and why they would choose your offering can be downright difficult to get a grip on. Collecting all of this juicy information on your people, however, will come in handy as you kick things up a notch to sketch out an ideal customer profile (aka brand persona/avatar). Yes. But, don’t you worry. If you’re not a highly skilled artist, you can still tackle this step. That’s because I’m simply referring to crafting a written composite of your ideal prospect, which will help you tackle the writing process for emails, sales pages, and so much more. If you’re feeling completely lost on the execution of this tip, you’ll want to check out this blog post—The Ultimate Guide on How to Catch Your Perfect Customer. 2. Have the end goal in mind. While you’re at it, make sure it’s one goal, and one goal only. Start with the reason why you’re sending the email. Is it to increase sales? Ramp up registration for a webinar? Or even launch a new product or service into the universe? Once you decide, you can then hone in on who exactly will be on the receiving end of your email, why that specific audience should care (aka the benefit), and how you’ll measure the results from the campaign. As a result of your “goal setting,” you’ll then be able to thoughtfully craft each of the copy elements for your email (which I’m about to dish out) to effectively connect with your people. 3. Create a scroll-stopping subject line. Think about when you’re hurriedly scrolling through your inbox (with no end in sight might I add) to see if anything “important” has come your way. All of a sudden, a specific subject line captures your attention. You’re curious, so you click on the message and continue to read what the sender has to say. Well, that subject line sure did its job, wouldn’t you agree? Therefore, you need to make sure your email’s subject line does the same thing— creatively captures the recipient’s attention, without revealing too much information! Invoke a sense of urgency—hello, FOMO (fear of missing out) is real. Tell them they’ll be missing out if they don’t open to see what it is you have to say! Connect with the recipient—and, by connect, I mean that you need to make them feel as if you’ve read their mind. You know all about their current headache, need, or want, and you’re here to deliver what they’ve been searching long and hard for. Speak to a pain point of theirs—rub some salt in their wound and bring up something that’s been causing them some frustration. You can do this by using one of my favorite methods—the Problem-Agitate-Solve method. Drop some numbers—for some reason, it just captures their eye. Makes them slow their scroll. And, click to see what all the commotion is about. To find out what works best for your audience, we recommend looking up the top email clients for your list, and then A/B test subject lines of different lengths. From our experience, 50 characters seem to be the ideal length. Otherwise, the rest of your message will be axed. 4. Don’t gloss over the preview text. You see, it’s just as important to give this element of your next email campaign attention as it is the subject line. Hot dang! Now you’re probably curious as to how you’ll write it the right way. Well, luckily, EmailOnAcid.com was generous enough to share specific methods you can use in a blog post. Check out the list below! Content Overview—Use your preheader to give a quick summary or overview of the content contained in your email. Subject Line Elaboration—Make your subject line and preheader text one cohesive message. Think about it. By including your preheader text, you double the amount of space you have to compel your reader to open the email you’ve sent. Incentive Teaser—Does your email include a special offer? Let your audience know in the preheader text what awaits them upon opening the email. Fun, Engaging Copy—Do something different to catch your reader’s eye and entice them to open your message. For example, make a punny joke or say they have to open to [fill in the blank]. 5. Write for your readers and not yourself. When you’re authentic and honest, and focus on your people and what they want to hear, you’ll achieve that end goal of yours. So, go ahead and take a walk in your ideal customer’s shoes, and develop a rock-solid understanding of the following behavioral psychology principles to kick your copy and conversions up a notch. After you’re done here, you can head over to this blog post I put together to learn more about each of these principles. 6. Get personal with your subscribers. This is where things get a little technical. You may think just because you’re mass emailing your people that there’s no chance you can make your message personal. But, think again. If you’ve been collecting first names of your subscribers (and, if you’re not, you need to be ASAP), there’s no excuse for you to not include their name in each and every campaign from here on out. For example, MailChimp—just one of many email marketing services—offers “merge tags,” which are based on subscriber data (first name, last name, etc.) so you can inject personalized, dynamic content into your campaign. As Wishpond.com explains, you can also write in the second person by using “you,” “me,” and even “us.” This is really the simplest way to inject some friendly vibes into your email. Limit each email to two to three personalizations. You don’t want to seem creepy to your contacts. Go beyond first name personalization. Personalize email content based on the users’ history or behavior. How would you talk differentially to a trialist who is active in your SaaS product than one who has never logged in. Personalize the from address. Addressing an email from a lead owner, account owner, customer success manager, community manager, or CEO adds a personal touch and drives higher open and response rates. 7. Drop in a compelling call to action. Often, when writing copy for your emails, you can become hyper-focused on telling a great story, connecting with your ideal customers, and even dropping in perfectly formulated words and phrases that you actually forget one crucial component: a call to action (aka CTA). And, if you fail to tell your people what it is you want them to do, they won’t do it. It’s just that simple. Therefore, this is where having your end goal in mind from the very beginning will come in handy. Basically, what you hope your subscribers will do with your email will become your CTA. Just be sure when you’re actually writing it, however, that you start it off with a verb such as Get, Download, Start, Join, Learn, Discover, and so one. If you want more great tips on crafting a compelling call to action, check out this blog post. 8. Test, and test again. Implementing these tips won’t keep you entirely in the clear. You’ll still need to keep a close watch on your email metrics as soon as you send a message out to your list. For example, what happens if you’re noticing a meager open rate? Don’t waste any time evaluating your audience selection and subject lines. If, on the other hand, your click-through rate is low, yet your open rate is okay, evaluate your content and readability. Then, adjust as needed, and continue learning and bettering your campaigns as you go. Well, there you have it—the eight email copywriting tips that will help you get noticed and win those coveted conversions you’ve wished for. If you’re looking for a checklist that’ll ensure no matter what you’re offering up in your email campaigns that it’s absolutely irresistible, look no further than my free PDF download—The Copywriting Checklist That Will Make Your Offer Irresistible. Just enter your email address into the box on the right side of your screen, and it’s yours! Have a question you need answered or a favorite tip I missed sharing? Let me know in the comments section below. I’d love to hear from you!